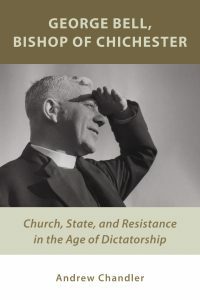 Review of Andrew Chandler, George Bell, Bishop of Chichester: Church, State, and Resistance in the Age of Dictatorship (Grand Rapids, MI: Eerdmans, 2016), Pp. xii + 212, ISBN: 9780802872272. In George Bell, Bishop of Chichester: Church, State, and Resistance in the Age of Dictatorship, Andrew Chandler grapples with the ecumenical and political legacy of this influential bishop. Beginning with a description of the eclectic contents of one of Bell’s little blue notebooks, Chandler explains how it “captures a mind and a soul in perpetual motion in the world: attentive, enquiring, pursuing. It is a testament of Christian life in the middle twentieth century, wrought out of the turmoil of politics, war, persecution, calamity. It is a proof of one man’s decision to take his place in such a world, and to do so as a faithful Christian” (4). George Bell was born in 1883 on the south coast of England, into a “secure, comfortable middle-class clerical home” (7). He attended Westminster School beginning in 1896, then Christ Church, Oxford, in 1901. Next he enrolled in theological college in Wells, in the West of England, where he was introduced to the student ecumenical movement and to Christian Socialism. Ordained as a deacon in Ripon Cathedral in 1907 and as a priest in Leeds in 1908, Bell returned to Oxford in 1910, where he combined a growing commitment to social justice with a vibrant personal faith. As he explained, “Christianity is a life before it is a system and to lay too much stress on the system destroys the life” (12). After this overview of Bell’s formative years, Chandler breaks Bell’s ecclesiastical career into a series of chronological chapters which revolve around his positions and causes. Chandler begins with Bell’s time as domestic chaplain to Archbishop Randall Davidson of Canterbury (1914-1924), as dean of Canterbury (1924-1929), and as the newly appointed bishop of Chichester (1929-1932). From there the author examines Bell in his various roles as an interested observer and periodic participant in the German Church Struggle (1933-1937), as an ecumenical leader in a continent hurtling towards war (1937-1939), as a champion of peace in a time of war (1939-1942), as an active supporter of the German Resistance (1942-1945), as a leader in the postwar ecclesiastical reconstruction of Europe (1945-1948), as a key figure in the emergence World Council of Churches (1948-1954), and as an elderly bishop winding down his career (1954-1958). Throughout these diverse phases of his career, the breadth and volume of Bell’s activities was formidable. Over a span of more than fifty years, he wrote, edited, and contributed to over two-dozen books, ranging from poetry and ecclesiastical biography to credal, incarnational, and pastoral theology, to Christian unity and the relationship between the church and modern politics. Along with his leadership in the Church of England, Bell was a force in numerous international ecumenical institutions, including the World Conference of Life and Work (particularly in Stockholm in 1925 and Oxford in 1937), other ecumenical meetings at Fanö in 1934 and Sigtuna in 1942, the postwar Treysa meeting with German church leaders, and the World Council of Churches, where Bell was elected moderator of the Central Committee at the first WCC assembly in Amsterdam, in 1948. Bell’s activities were often centred on German affairs. Almost immediately after the rise of Hitler, Bell and his colleague A.S. Duncan-Jones, who was Dean of Chichester, monitored German politics and visited contacts in the German churches, in order to understand the nature of the German Church Struggle for themselves. Bell soon became a critic of the Nazi dictatorship, the pro-Nazi German Christian Faith Movement, and the policy of persecution against both non-Aryan Christians and Jews in general. Around this time, the young Dietrich Bonhoeffer was serving in a German congregation in London, and he and Bell began to develop a warm friendship. Over the following years, Bell regularly spoke out against the Hitler regime and its supporters within the German churches. When the German delegation failed to appear at the 1937 Oxford Life and Work conference, Bell won support for a letter noting the absence of the German delegation and expressing concern over “the afflictions of many pastors and laymen who have stood firm from the first in the Confessional Church for the sovereignty of Christ, and for the freedom of the Church of Christ to preach His Gospel” (64). After Martin Niemöller’s incarceration in a concentration camp, Bell maintained close contact with the Niemöller family and wrote a stirring foreword for an anonymous biography of the Berlin pastor, in which Bell praised the faith of those standing for the Gospel in Germany. And when the Jewish refugee crisis began to grow acute in 1938, Bell spoke on behalf of refugees in his inaugural speech in the House of Lords, and also lectured publicly about the crisis, describing it as a “crisis of humanity” (69). Chandler’s description of George Bell’s wartime activities illustrates both the breadth of Bell’s concern and the regularity with which his principled participation in continental political and ecclesiastical affairs pushed him out of step with his peers in the Church of England and British House of Lords. First of all, Bell argued that the church’s role in war was distinct from that of the state. The church was to be a universal body, “charged with a gospel of God’s redeeming love” and tasked with “creating a community founded on love” which would outcast the changes brought about by war (75). Whether in war or in peace, the church, declared Bell, should stand for principles like “the dignity of all men, respect for human life, the acknowledgment of the solidarity for good and evil of all nations and races of the earth, fidelity to the plighted word, and the appreciation of the fact that any power of any kind, political or economic, must be coextensive with responsibility” (75). Second, Bell worked for peace, championing the vision of a federal union of European states and arguing for negotiation with the German state, even in the midst of the war, in hopes that the Germans would remove Hitler from power. His position was shared by few. Karl Barth felt Bell was “too much a British gentleman and thus unable to understand the phenomenon of Hitler,” while Archbishop Cosmo Lang wrote Bell: “You are an optimist and I am a realist” (81, 82). In the same way, Chandler shows how Bell’s views on the morality of war were at odds with his contemporaries. When Bell opposed the internment of German and Austrian refugees as enemy aliens in the House of Lords, a fellow member wondered whether the bishop realized England and Germany were at war. When Bell tried to distinguish between Germans and Nazis, he was vigorously opposed in parliament and harangued by a Chichester parishioner. When he protested in the Convocation of Canterbury against the area bombing of German cities, he was shouted down. Worse still, at home in his diocese, he had become so unpopular that Duncan-Jones suggested he not attend a military service at the Chichester Cathedral. Chandler does an admirable job of explaining the role for which Bell is often best known in German history circles—his activity as secret intermediary between the German Resistance and the British government. In late May 1942, in the city of Stockholm, Bell met with German Pastor Hans Schönfeld of the International Christian Social Institute in Geneva, whom he had known for over a decade. Schönfeld explained that there was a growing opposition movement within Germany, determined to topple Hitler from power and restore the German government to a Christian basis. A few days later, he provided Bell with a list of the names of important conspirators. Just after that, Bell met with Dietrich Bonhoeffer in Sigtuna, Sweden. Bonhoeffer also outlined the nature of the German Resistance, urging Bell to ask the British government for assurances that the Allies would negotiate with the German opposition, if it could seize power. This Bell did, meeting with Foreign Secretary Anthony Eden, but to no avail. Chandler explains not only the government’s skepticism about such “peace feelers,” but also the way in which Bell’s continued lobbying made him suspect and undermined his mission further (100). After explaining Bell’s determined efforts towards postwar reconciliation and the establishment of the World Council of Churches, Chandler assesses Bell’s legacy in a concluding chapter. There he paints the image of Bell as a man of many interests, causes, and campaigns—indeed, as a man of paradoxes. A member of the Establishment who “did not quite belong to it,” Bell “so often refused to conform to categorical expectations” (166, 170). He was an Anglican with an ecumenical orientation, an Englishman who cared as much or more about international affairs as English matters, and a man of deep devotion who lived large parts of his life in the world of politics. Influenced by high-church incarnational theology, Bell worked to bring art and artists into the life of the church, even as he also exerted himself on behalf of social justice for the working classes and hospitality for Jewish refugees fleeing Nazi persecution (170-171). Most especially, perhaps, he stood for principled and often unpopular positions, such as ecumenical unity and international peace in a time of nationalism and war. Sadly, no new biography of Bishop George Bell can avoid dealing with the October 2015 allegation that Bell “had committed sexual offenses against an individual who was at the time a young child” (170). Chandler laments the fact that almost everyone associated with this time has passed away, making it virtually impossible to consider the charges in a normal judicial process. He does not in any way deny that these offenses could have occurred, but does the only thing a historian can do, which is to attempt to place the allegations in their historical context. In an appendix devoted to the controversy, Chandler notes that Bell’s 368 volume archive contains his personal notebooks and pocket diaries from 1919 to 1957, in which he kept track of all his appointments and engagements. He notes Bell’s “conspicuously high view of the standards required by his office,” and adds that Bell was almost constantly observed, that he participated in many disciplinary processes for clergy, that he maintained what seemed like a happy marriage, and that he worked almost continually in the presence of his wife, secretary, domestic chaplain, or driver. Chandler interviewed the only member of Bell’s circle still alive, his domestic chaplain from the early 1950s. This man “is firm, indeed emphatic, that ‘no child or young teenager ever entered during my two years as Chaplain, except on the day in January chosen for the parish Christmas party which he and Mrs Bell laid on every year for the children of the clergy’” (198) Add to this that Bell tended to work with his door open and often held private conversations outdoors in the garden and it leads Chandler to describe the 2015 allegation as “anomalous” and seeming to exist “in its own world, evidently uncorroborated by any other independent source” (199). Andrew Chandler has published widely on the life and ministry of Bishop George Bell, and is the current acknowledged expert on him. George Bell, Bishop of Chichester is a concise, accessible overview of Bell’s engagement in the world of ecumenism and international politics during the turbulent times in which he lived and worked. It deserves a wide readership, especially among those who only know Bell as Bonhoeffer’s friend and English contact on behalf of the German Resistance.